Dead Cert is a well-made British mystery. Alan York (Scott Antony) who is a jockey. When his friend dies after a race, Alan takes it upon himself to figure out what happened. He uncovers corruption in the horse riding industry and the police force. The next part of the review does contain spoilers!!! 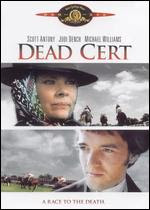 Dead Cert has good acting and directing, but the ending is flawed and weird. At the end, Alan and Sandy (Michael Williams) are racing their horses. They're right next each other and Sandy starts whipping Alan with his racing stick. Then Alan, whips back and makes Sandy fall on a sharp railing, and he dies. Alan wins the race but no one ever mentions that Sandy is dead. I thought that hurt the film a lot. If you can get past the odd ending, it's a decent film.